Creating vintage “chalk” furniture is quite the trend now-a-days, and for good reason really! Chalk paint can create a whole new look to furniture in a few easy steps. The finished product is soft in color and has an instant warm, farmhouse look. Below, you can see how some simple mason jars can become beautiful vintage vases with Chalk-tique! How does Chalk-tique work? This powdery additive, creates a creamy texture with any latex paint. 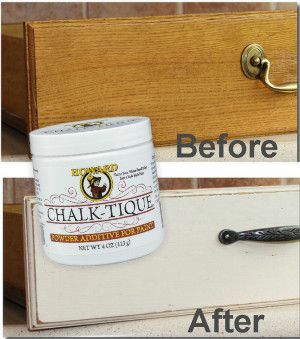 One 4 oz container of Chalk-tique can make up to 2 quarts of chalk paint. Because of the thickness of this product, most applications only need one coat of paint, which means that you can enjoy your new creation even sooner! Want to add a rustic, vintage look? Once the paint has dried, come back over the edges and some of the details with some sandpaper and put the finishing touches on your preferred look.